Thanks very much for your early reply. I am sorry to say that I have never had a meeting with you. 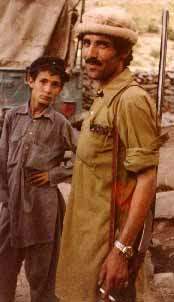 This may be due to the fact by the time you were in Chitral I was a small boy studying in school. I am happy to tell you I am from proper Mastuj. I am a very close neighbor of Col. Khuswakht-ul-Mulk. My full name is Tameez Ahmad. I came to UK a few years ago to pursue higher studies in Civil Engineering. I have recently completed my Ph.D. studies and planning to go back Pakistan within few weeks. I do have a very deep sympathy for what had happened to you. I can easily understand the intrigues of my Muslim brothers. However, I am curious to know that what were the basic reasons which created big difference between you and your wife while she was with you in US? Was it on religious or social background or anything else? I don't know exactly but I had heard in Chitral that your wife turned against you when she found that you were not real and practicing Muslim. Would you mind telling me where do you live in USA, I means how much far away from New York. By the way can you speak Khowar fluently? I hope you don't mind asking the above personal things. If you want to ask anything please let me know. Subject: Re: Well done ! I live in New York City, in Brooklyn at the moment. I have been to Mestuch. I stayed in the home of a boy named Bulbul who later went to engineering school. I also went to Yarkhun and Brep. The story that Honzagool left me because I was not a "true Muslim" is just slander spread by Raja Ehsan Aziz and others. In the first place, Honzagool did not care about religious matters. Her mother was still teaching her how to pray when she married me because Honzagool had never bothered to learn. The reasons were purely financial. Aziz-ur-Rehman was using Honzagool to extort money out of me. If I did not give him money, he would take her away from me and put her in the home of Sher Malik in Bronx, New York. When I paid him off, he would bring her back. I though that this problem would go away after our baby was born, but I was wrong. Honzagool did not care about her baby. The proof is that Honzagool went back to Pakistan leaving her baby behind in America on August 28, 1982 and since then has never seen her daughter nor has she even written her daughter a letter. I will think about this and perhaps come up with something in a few days. I am not at all fluent in Khowar. If you see any mistakes or errors in my on-line dictionary please let me know right away. I am also especially interested in finding more examples of the CHH retroflex type of sounds which exist only in Khowar and nowhere else.